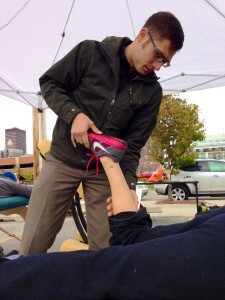 Dr. Chris LoRang treats a runner’s sore calves with Active Release Technique (ART) after the Des Moines Marathon 2013. Dr. Chris LoRang treated many sore, tight, and cramped leg muscles at Sunday’s Des Moines Marathon. With Active Release Technique (ART), a soft tissue therapy for athletes, Dr. LoRang targeted runners’ pain points to help get them on their feet again after their 5K, relay, half, or full marathon. Capital Chiropractic and Rehabilitation Center was pleased to support Des Moines’ athletes as part of the Lululemon Revival Event following the race, along with Jeff Peck from Performance Nutrition Plus, John Cornish from John Cornish Wellness, Ryan Esdohr from Iowa Powered Yoga, and Dr. Brooks Newton and Dr. Jon Roed from DSM Spine+Sport.